It may not be a safe time in history to mention this, but I worked briefly for a real estate marketing company that handled the pre-sales at the TRUMP building in Vancouver. While at that time he was not a Presidential Candidate, he was still a rich, egotistical man with bad hair and a polarizing effect on the public—even in Canada. But one good idea came out of my time touring Buyers around the swanky TRUMP Presentation Centre: my bathroom design. The TRUMP site was the first time I saw a “wet room” bathroom, with the bathtub built INSIDE the shower. 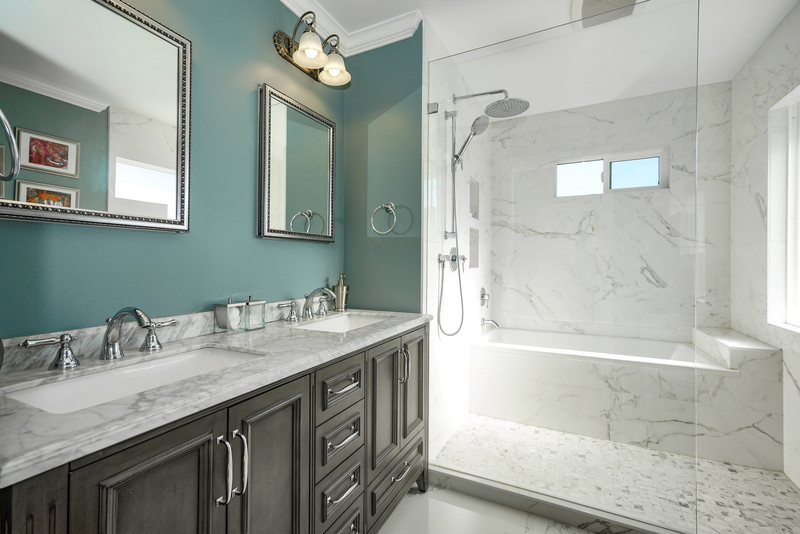 It’s a bathroom style that is gaining a lot of popularity because, while it’s a bit more work to install and waterproof, it is actually a very practical and space efficient way to build a bathroom. When we were trained on the details and specs of the bathroom, we were told residents could fill the bathtub with cold water, and alternate between a hot shower and a cold plunge, if they were so inclined. My heritage is Swedish, but you won’t see me in an icy plunge pool! We began thinking about the design of our main upstairs bathroom in the autumn of 2015. We were removing a huge jetted bathtub, a single sink with a long vanity, and a dated, stained toilet—essentially a gut job. My husband is handy, and I helped where I could with demolition in early 2016. Upon removing all the components of the bathroom, and dealing with some minor moisture ingress from shoddy maintenance, we found that the bathroom had not been properly insulated at all, and the vapor barrier was thin and not up to current building codes. We knew we wanted a shower enclosure for this bathroom, since it is the largest and most used on our second floor (our ensuite is disappointingly small). Yet, for re-sale in the future, we knew that for families, a bathtub was essential. So we measured and found that we could squeeze a bathtub and standup shower into the void left by the jetted tub. My vote was for an elegant claw-foot tub (sigh!! ), but this couldn’t be achieved without extra plumbing, and re-opening our living room ceiling below. So we opted for a soaker tub with a recessed wooden skirt edge for tiling, and a shower beyond to maximize space. Instead of a traditional shower door, we would use one large pane of glass. It’s a great idea for a family bathroom, where there’s a lot of splashing going on! Consider systems that will waterproof the entire space, like Wedi Board and Schluter Board, which are often sold in tile stores. Stick with a central color scheme or matching tiles to make the room appear larger Use sleek insert shelves (also part of the waterproofing system) and a dramatic laser cut tile pattern to make a statement.